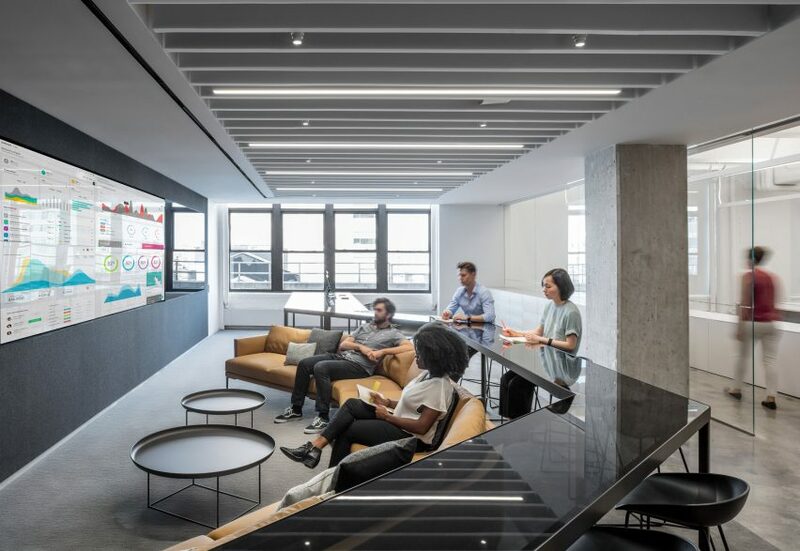 Architecture firm A+I has expanded the Lower Manhattan offices of ad agency Horizon Media, creating a variety of spaces that range from private phone booths to a break room that can accommodate up to 300 people. The company was undergoing rapid growth, so required new office spaces across additional floors of its existing building in Hudson Square, just north of Tribeca. 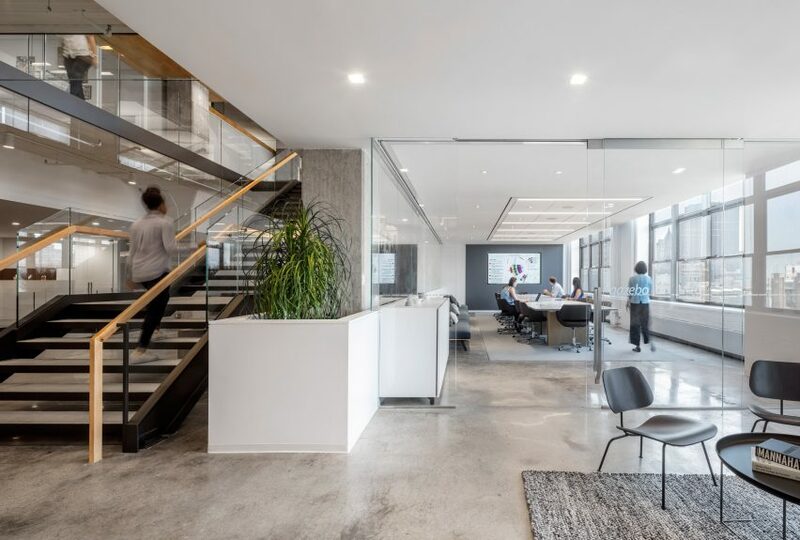 “A programmatic study of their needs and growth throughout the years of was used to develop a strategy to allow flexibility within workstations, while also adapting to different types of working to meet the evolving needs of their new reality,” said A+I, based in New York City. To make the most of the triangular floor plate, the architects located most workstations along the periphery, and tucked away other programmes closer to the core. The desks are laid out in an open-plan configuration, and run parallel to a series of enclosed offices that form a ring around the central core. The corners of the triangle were used to create gathering areas, which benefit from more natural light, as well as varied views outside. To the north, the architects planned a break room dubbed The Local. They describe it as “a social hub that will be utilised by employees and their guests to allow for new interactions between groups who rarely interact within such a gigantic company”. This informal area can accommodate up to 300 people, and includes a screen that broadcasts the activities of the company’s offices in Los Angeles. It is adjacent to a smaller, private dining room. The southern corner of the triangle is home to the “garden”. Here, circular raked seating surrounds a central stage. “Custom loveseat seating on radiating tiers allows participants to face each other and offers breakout spaces in the upper tiers behind the seating,” the architects said. Interior finishes chosen for the offices include wooden floors and exposed concrete columns. Multiple planters add greenery to the space, and casual seating throughout provides places to meet informally. A+I has also completed the New York offices for website building service Squarespaceusing a similar palette. On the West Coast, the studio used dichroic glass panels to define social spaces in the offices of Los Angeles ad agency Canvas.